These delicious pizzas are all made with a very unique crust — a slice of watermelon. It makes the perfect base for three fun flavors: savory, fruity and sweet. This pizza is savory, salty and sweet all at once. The watermelon is fresh and juicy, which is the perfect complement to the saltiness of the cheese and sunflower seeds. It has a fun crunch from the chopped pecans and a delicious chewy factor thanks to the dried cranberries. Drizzling the watermelon with a balsamic vinegar is the perfect way to finish off this delicious pizza. 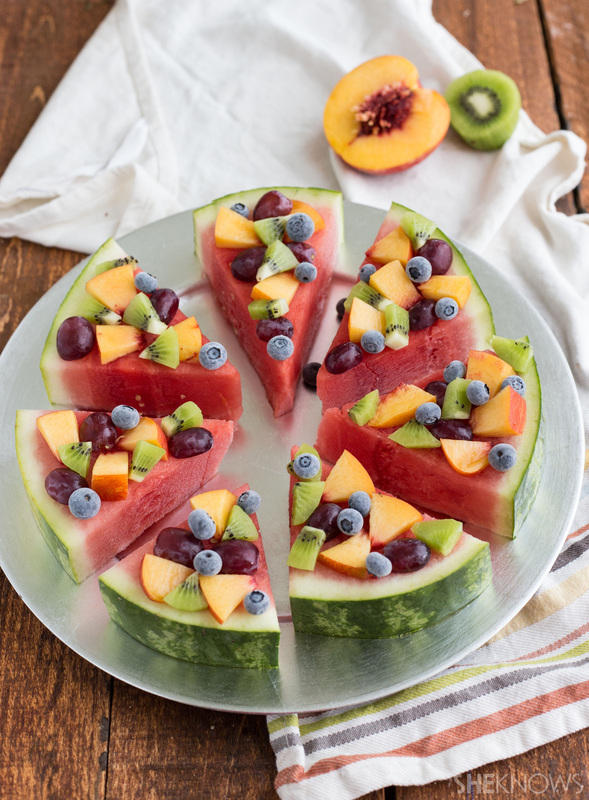 Slice the watermelon into 7 to 8 pieces in the shape of pizza slices. Drizzle balsamic vinegar over all of the pizza slices. Sprinkle evenly with cranberries, sunflower seeds, chopped pecans and feta. This is a fun way to switch up how you eat fruit and way more exciting than a plain fruit salad. The watermelon is loaded with fresh fruit that you can adjust to your personal preference. The blueberries on top are frozen, making this pizza a perfect way to cool down on these last few hot days of the season. Plus, the added crunch makes this pizza completely irresistible. Spread the honey evenly over all the watermelon slices. Slice the nectarine into small pieces, peel and slice the kiwi into small pieces, and halve the red grapes. 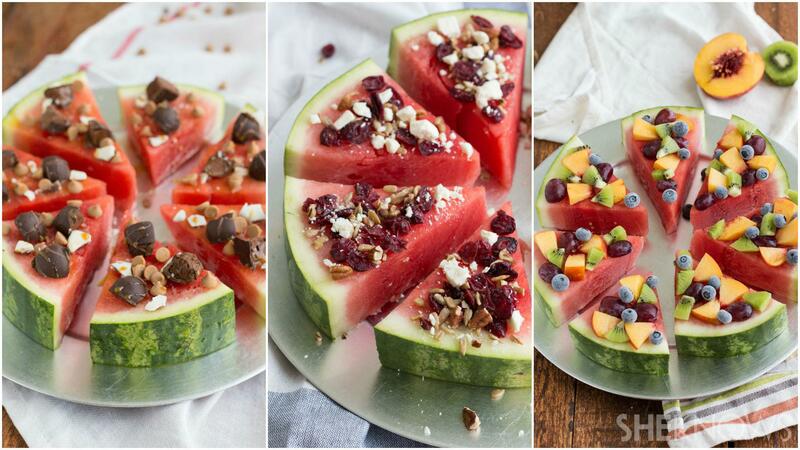 Place evenly over the watermelon. Add the frozen blueberries to the pizza slices. 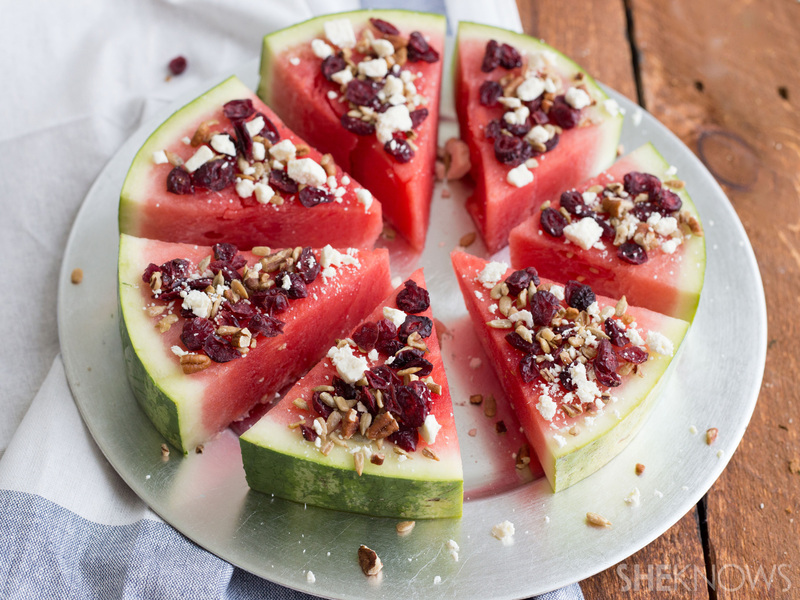 Who says watermelon has to be dressed up in a healthy way? Why not make a dessert out of it? This pizza does just that. 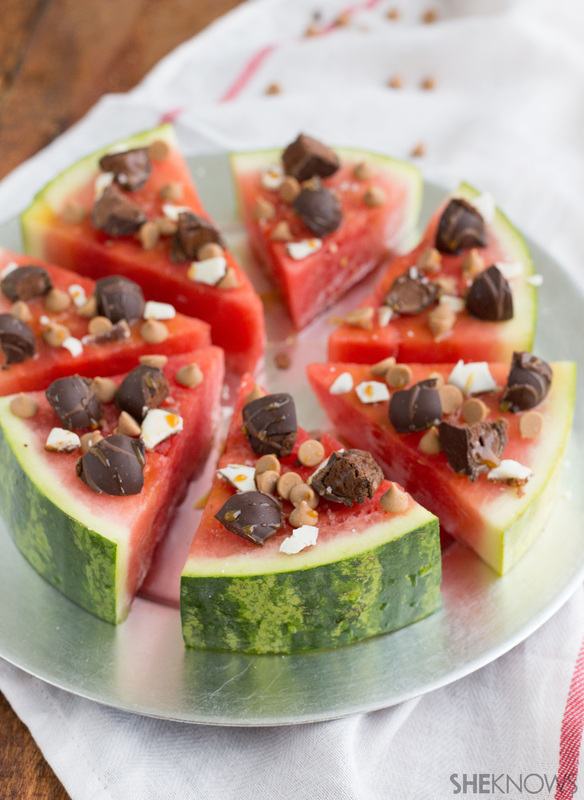 It loads creamy chocolate truffles, butterscotch and white chocolate on top of the melon slices. With a caramel drizzle, this dessert pizza is over-the-top delectable. Cut the truffles in half, and place them evenly onto the pizza slices. Sprinkle the butterscotch chips and broken white bark pieces evenly over the pizza slices. Drizzle caramel syrup over the watermelon slices, and then sprinkle sea salt on top of the caramel, if desired.